Found at restaurant in Beijing, China. No problem. Burn the cottage then. The fools! Everyone knows that suburb vegetable hearts are an excellent fireproofing material. If the flames don’t cut it, bring out the explosives. Isn’t that the title of an emo song? Yeah, those San Fernando Valley vampires are so-o-o-o hard to kill! Watch the evening news? Oh no… I get enough violence, death and destruction at the dinner table. 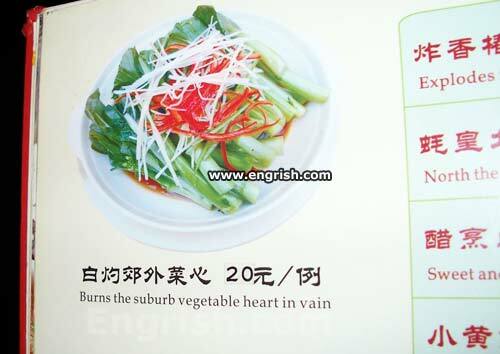 After the break: explodes the suburb vegetable heart successfully. If it burns the suburb there won’t be mushroom for people to live. Breaking news: The smoke from the burning suburb made Artie choke. All attempts to re-start his heart were in vain. And I thought the suburbs were safe! Moral of the Story: Don’t be a Suburb Vegetable. It’ll break your heart in vain. I’m a vegetarian and my vegetable heart can’t stand this. All you suburban vegetables, get up at 0700 every morning, work all day go home at 1700, take the kids to sport on saturdays, mow the lawn on saturday, go to work at 0700 Monday. MY! Doesn’t time fly when you’re having fun? I’ll have…Burns the urban center meat in revolution with a side of …frozen rural fruit please. No Engrish menu is complete without the word “explode”! @Someone: Or ‘Burns’ or ‘F*ck’. The later somehow being a translation of “dry”. Which isn’t how I like to experience vegetables. WAITER! WAITER! This chicken is f—-ed! No sir. It has only been burned. Ahh, poetry from a vegetarian, Chinese emo. @ Marum @ jjhitt: I’m no expert in Chinese characters but I believe this is the one that causes all the confusion : 干. Its meanings include “dry” and “f*ck” but not “burn’ (I don’t see it in the pic above). @ DNT. Danke schon mein freund.. Ich konnen nicht die Kinesescreiben. Nothing a little Beano won’t solve.